The 2013 Hyundai Sonata is one of the fastest-rising models in the mid-size sedan segment, as its manufacturer has combined a wealth of features with compelling styling. With a lengthy warranty, the Sonata offers normally-aspirated and turbocharged 4-cylinder engines, and a hybrid, but there is no V6 option. The title of my review should be a car that has something for everybody. 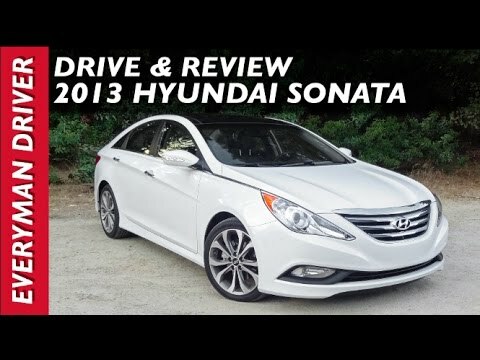 The reliability of the Sonata is great. We have at least 60, 000 miles are the car and so far we have no issues. Also, considering the size of the car it is comfortable to drive long distances. Instead, of having your feet hanging down in the driving position your feet are out. It is liking sitting in a lounge chair. Another thing I like the trunk is huge. There is plenty of room to store big bags for long trips. This does not take any room from the people sitting in the back. These person in the back seat have plenty of legroom. I have the interior of this car to have more room than cars that are much larger. Lastly, I like the ability to switch the ego button on thus saving on gas on the open highway. When you need more power you just switch the button off. When the road gets rough, the car is not to harsh having enough spring in the suspension for a comfortable ride. This car has it all. Ups and downs of my hybrid experience. For the most part I love my Sonata hybrid, however, my husband is not very happy with the 'hybrid' part of it. We went with the more expensive hybrid because of the good reviews and it being more gas efficient. During the summer. That rings true. On trips I have gotten up to 40 miles a gallon. However, during the winter, which we get really cold ones in MN. I am lucky if we get 23 mpg. This is very unfortunate since our winters are much longer than our warmer weather. I doubt we would never buy a hybrid again. And due to the fact that this one is a Hyundai I doubt my husband will want to by that brand again in the future. Although I love the ride of the car myself and it to me is a very fun car to drive and wonderful for road trips!! It has everything I need! My vehicle is pretty reliable, and has not given me any trouble since I purchased it used 6 months ago. I was commuting about 40 minutes to and from work 5 days a week in Atlanta traffic and it held up great. Not to mention it did pretty well on gas. It is very comfortable. The seats are leather which I love because it is easy to clean and does not trap smells. My car also has heated seats in the front and the back. There’s a panoramic sunroof/moonroof that provides a really nice view. The car is equipped with Bluetooth so I can play my music from my phone as well as answer calls hands-free. There’s also a GPS in the car and the display is touch screen. I get lots of compliments on my car overall, and I'd highly recommend it. Hyundai will notify owners, and dealers will inspect and, as necessary, repair the connection between the shift cable and shift lever, free of charge. The manufacturer has not yet provided a notification schedule. Owners may contact Hyundai customer service at 1-800-633-5151. Hyundai's number for this recall is 123. Hyundai will notify owners, and dealers will inspect the engine, replacing the engine short block, as necessary, free of charge. The recall is expected to begin May 19, 2017. Owners may contact Hyundai customer service at 1-800-633-5151. Hyundai's number for this recall is 162. Hyundai will notify owners, and dealers will again verify the connection between the seat belt linkage and the pretensioner and additionally install a warning label to prevent future seat belt linkage detachment, free of charge. The recall is expected to begin in October 2017. Owners may contact Hyundai customer service at 1-855-371-9460. Hyundai's number for this recall is 169. Hyundai will notify owners, and dealers will inspect and replace the fuel pipe, as necessary, free of charge. The recall is expected to begin in February 2019. Owners may contact Hyundai customer service at 1-855-371-9460. Hyundai's recall number for this recall is 180. Hyundai is recalling certain model year 2012-2013 Hyundai Sonata passenger cars, manufactured from January 24, 2012, through June 21, 2012. The curtain side airbags on these vehicles may inflate without deployment command due to an error during manufacturing. The curtain airbag may inflate without deployment command and increase the risk of injury to occupants of the vehicle. Additionally, an unexpected deployment would be a significant driver distraction and would limit the driver's visibility, increasing the risk of a crash. Hyundai dealers will notify owners, and dealers will replace the curtain side airbags free of charge. This recall is expected to begin during August 2012. Owners may contact Hyundai at 1-800-633-5151.